Beijing and Washington are locked in a spiralling trade war that has seen them level increasingly severe rounds of tariffs on each other's imports. Friction between the world's top two economies is now moving beyond trade, with U.S. President Donald Trump accusing Beijing this week of seeking to interfere in congressional elections, marking what U.S. officials told Reuters was a new phase in an escalating campaign by Washington to put pressure on China. On the military front, China has been infuriated by the United States putting sanctions on the People's Liberation Army (PLA) for buying weapons from Russia, and by what Beijing sees as stepped up U.S. support for self-ruled Taiwan, claimed by China as its sacred territory. "There is a lot of uncertainty because of the turbulence in the relationship," said one the sources. The second source said that the People's Liberation Army was especially unhappy with the United States at the moment because of the U.S. sanctions on the Chinese military and U.S. support for Taiwan, including approving a new round of arms sales this week. "The PLA is fed up over the Taiwan issue. They're increasingly hardline on this," the source said. China's Defence Ministry said it was talking to the United States about the dialogue. 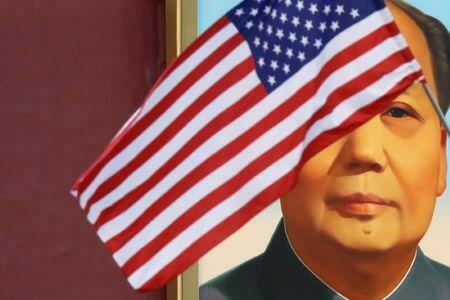 "China and the United States have all along maintained communication about the diplomatic and security dialogue," it said in a statement to Reuters, without elaborating. China's Foreign Ministry said in a short statement sent to Reuters that the two countries were in "close contact" about the dialogue, and that if it had any other information it would release it in a timely manner. While China has denounced what it called his "slander", it has so far held off taking any direct steps to retaliate. However, prior to Trump's remarks Beijing cancelled a previously set round of military talks with Washington over the sanctions on China's military, and has denied a U.S. warship permission to visit Hong Kong in October. The Chinese government's top diplomat, State Councillor Wang Yi, said on Friday there was "no cause for panic" over friction between Beijing and Washington, but warned that China would not be blackmailed or yield to pressure over trade. "Divorce is the word I use," Tu Xinquan, a trade expert at Beijing's University of International Business and Economics who has advised the Chinese government, told Reuters recently. "Now, most people believe Trump is trying to contain China. Many government officials think this way." "I think there are leaders in the U.S. government who believe that so long as the Chinese system is not willing to change, then the next best scenario for the United States is a gradual decoupling of the economies," Tim Stratford, managing partner of law firm Covington & Burling's Beijing office and a former senior U.S. trade diplomat, said in a recent podcast. Ruan Zongze, a former Chinese diplomat now with the China Institute of International Studies, a think-tank affiliated with the Foreign Ministry, called it unrealistic to think the two countries could "decouple" considering how inter-connected they were. "It's like two people having an argument," said Ruan. "Can you really resolve it if you stop speaking to each other?"